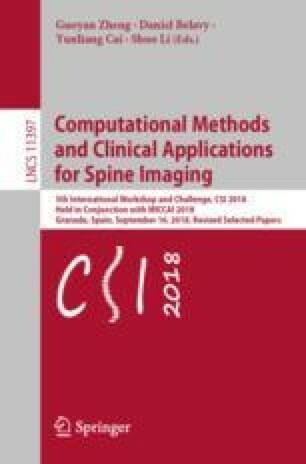 We describe a method to automatically predict scoliosis in Dual-energy X-ray Absorptiometry (DXA) scans. We also show that intermediate representations, which in our case are segments of body parts, help improve performance. Hence, we propose a two step process for prediction: (i) we learn to segment body parts via a segmentation Convolutional Neural Network (CNN), which we show outperforms the noisy labels it was trained on, and (ii) we predict with a classification CNN that uses as input both the raw DXA scan and also the intermediate representation, i.e. the segmented body parts. We demonstrate that this two step process can predict scoliosis with high accuracy, and can also localize the spinal curves (i.e. geometry) without additional supervision. Furthermore, we also propose a soft score of scoliosis based on the classification CNN which correlates to the severity of scoliosis. We are extremely grateful to all the families who took part in this study, the midwives for their help in recruiting them, and the whole ALSPAC team, which includes interviewers, computer and laboratory technicians, clerical workers, research scientists, volunteers, managers, receptionists and nurses. The UK Medical Research Council and the Wellcome Trust (Grant ref: 102215/2/13/2) and the University of Bristol provide core support for ALSPAC. This publication is the work of the authors and Amir Jamaludin will serve as guarantor for the contents of this paper. This research was specifically funded by the British Scoliosis Research Foundation, and the DXA scans were funded through the Wellcome Trust (grants 084632 and 079960).